SPOKANE, Wash. – The Washington State University College of Nursing has received a new federal grant to expand a program to diversify the nursing workforce in the Tri-Cities and Yakima. The purpose of the three-year, $1,041,000 grant from the Health Resources Service Administration (HRSA) is to continue to serve students from disadvantaged groups who are interested in pursuing nursing careers. It builds upon an initial HRSA grant, awarded in 2010, that set up the infrastructure for the program. 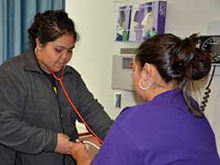 “The nursing workforce is not as diverse as it could be, especially in rural areas with high populations of Hispanics and American Indians,” said Janet Katz, College of Nursing associate professor. Students in those groups often run into financial and academic obstacles when they consider higher education, she said. The program provides academic and mentoring help to students and stipends to pay for their transportation to and from weekend and summer workshops. It also pays tuition grants to students in college nursing programs. “We know that if we can get these students through school to get their BSN (bachelor of science in nursing) degrees that many eventually return to work in their home communities,” said Katz. During the first three-year phase of the project, about 250 students in the Tri-Cities, Yakima and Spokane received academic and mentoring help, said Robert Garza, student services manager for the college at WSU Tri-Cities. Of those, 45 have either earned their BSN at WSU or are working toward it. “We connect these students with professional mentors in the community and work with them to help make them more competitive when they apply for nursing school,” said Garza. The new grant will allow the program to reach another 300 students in high schools and pre-nursing programs and 75 more who are pursuing bachelor’s degrees at WSU, he said. The grant will add two high schools, Chiawana (Pasco) and Grandview, to a program that already includes Pasco High School and Davis High School in Yakima as well as WSU, Columbia Basin and Yakima Valley colleges and Heritage University in Toppenish. Spokane’s Rogers High School was initially part of the program but is no longer. For more information about the college, visit http://nursing.wsu.edu/.